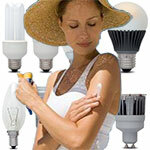 Home Articles News Scientific publications Should we put on sunscreen indoors? We all know how useful it is to protect ourselves from sun rays outdoors. But should we also put on sunscreen indoors? This is what a study conducted by Brazilian researchers suggests. But why? UV rays get through our windows, and the lamps we use to get light also emit some. And although it is in limited quantities, they might be harmful for the skin. The study was conducted by researchers at the Department of Clinical Pathology of the University of Campinas in Brazil and published in the International Journal of Cosmetic Science . Then, they provide details on the sources of radiation to which we are exposed indoors. Other than the radiation that gets through windows, the artificial light of illuminating lamps might also have long-term effects on health. This does not prevent them from suggesting in conclusion that sunscreen should also be used indoors. Now it only remains for cosmetic brands’ marketing departments to seize the opportunity and use this information to try and convince us! • See the article published in the International Journal of Cosmetic Science: Update on ultraviolet A and B radiation generated by the sun and artificial lamps and their effects on skin.